The unthinkable has happened!! 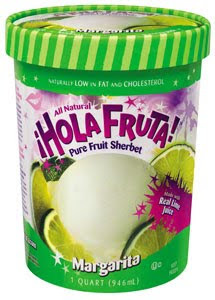 I hate to say it, I really do, but I've discovered a flavor of Hola Fruta I don't like. Sure it's still top notch quality, but the flavor is OHHHH so potent. I guess the problem is that I've only had cheap green lime flavor before, I've never had quality stuff. Don't be fooled by the Margarita name, there's nothing in here for flavor except lime puree. The first bite was the most shocking, but the following bites we're still quite potent. I don't know what flavor they could mix it with (like they did with blueberry and pomegranite), but I can only recommend this to people who love lime.